Introduction: Over the past two decades, laparoscopic cholecystectomy has replaced open cholecystectomy as the standard of care for benign gallbladder disease. Recently, attempts have been made to remove the gallbladder through single skin incisions to improve the cosmetic, and possibly other surgical outcomes such as pain. This more complex approach is generally thought to be associated with a longer operative time, and suitable for the less obese patients with no past abdominal surgical history. Here we report our experience with single incision cholecystectomies, looking at operative times, complications rates and patient demographics. Methods: In December 2008, we began offering all patients referred to the general surgery service for benign biliary disease the choice between traditional laparoscopic and single incision cholecystectomies. Biliary pathologies included acute cholecystitis, symptomatic cholelithiasis, biliary dyskinesia and gallstone pancreatitis. A single surgeon (AT) performed all the procedures at 2 different hospitals over a 10-month time period between December 2008 and September 2009. A retrospective review of all patients undergoing traditional laparoscopic and single incision cholecystectomies during this time was performed. Patient characteristics and outcomes of single incision cholecystectomies were reviewed and a comparison was made with traditional laparoscopic cholecystectomies performed during this time period. The technique employed involved placing two 5.5mm trocars at the umbilicus, elevating the gallbladder with transabdominal sutures, and using standard laparoscopic equipment and a 0 degree 5mm standard laparoscope. Results: Patient characteristics were similar in both groups. The mean age of the patients was 47.7. The average BMI of the single incision cholecystectomy patient was 30.8. Forty-four percent of patients had undergone previous intra-abdominal surgeries. Traditional cholecystectomies had an average procedure length of 61 minutes. 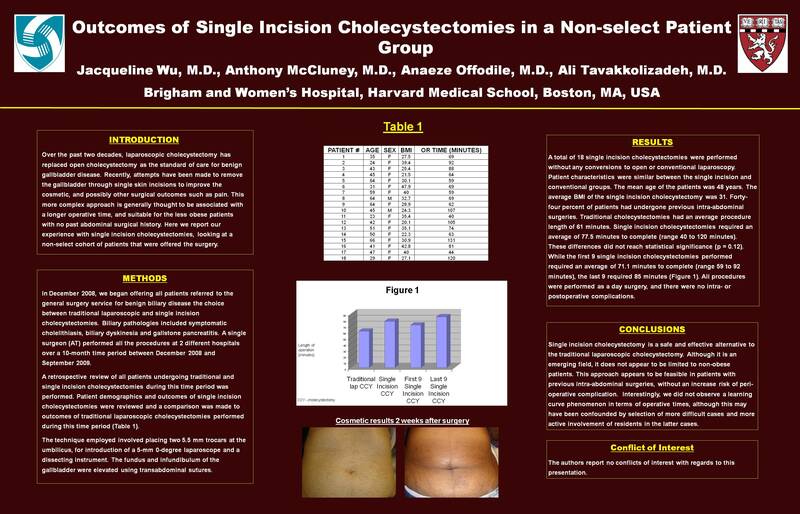 Single incision cholecystectomies required an average of 77.5 minutes to complete (range 40 to 120 minutes). These differences did not reach statistical significance (p = 0.12). While the first 9 single incision cholecystectomies performed required an average of 71.1 minutes to complete (range 59 to 92 minutes), the last 9 required 85 minutes (Figure 1). All procedures were performed as a day surgery, and there were no intra- or post-operative complications. Conclusions: Single incision cholecystectomy is a safe and effective alternative to the traditional laparoscopic cholecystectomy. Although it is an emerging field, it does not appear to be limited to non-obese patients. This type of surgery also appears to be feasible in patients with previous intra-abdominal surgeries.